Recent events and European privacy law changes have provided us with the opportunity to carefully consider how we handle your data and privacy. Let’s just get straight to the point. Streamside Software does not collect any data from you…as in none, zilch, zip, nada. This simplifies all of our lives, really. We can’t misuse or mishandle your privacy data, and, by the same token, we don’t have the obligations associated with the collection and safe storage of your privacy data. Let’s start by discussing the second part of that statement first. When considering whether to collect demographic information from our websites, we had to ask ourselves “why?” Why would we want to know who uses our apps? Would it change how we make our apps? Our answer is no. We create the types of apps we want to use ourselves, believing in turn that others will want to use them as well. Then we asked ourselves, would we want to target a certain demographic in our marketing? Again the answer is no. Honestly we think targeting users of a certain demographic is creepy, manipulative, and disingenuous. And while we are stating our beliefs, let’s go a step farther. 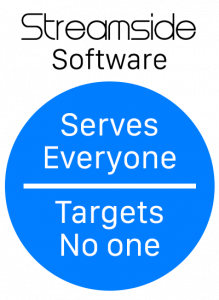 So what does “serving everyone” have to do with your privacy? Nothing, but it gets to the core of who we are as people. One of the two founders (and majority owner) of Streamside Software is the granddaughter of Albanian immigrants who came to America seeking a better life. Her grandparents started a restaurant in Jamestown, New York and made an honest living by working hard for countless hours, day after day. Inclusion defines who we are as a company and as individuals. It seems inconceivable to us that “tolerance” is something that needs to be stated in an age where it should be assumed, but yes, tolerance and coexistence are part of our core values, in every area of life. Our mission is simple. We are determined to make great apps, believing that if we do, success will come as a natural result, without manipulating customers. If this resonates with you in any way or if you’d like further clarification, feel free to drop us a line at feedback@streamsidesoft.com.